Many PA books I read seem to have been unintentional sequels to other books. My first post was The Stand by Stephen King. It looks as though Jack McDevitt had a bit of unintentional sequeling happen to him with Eternity Road. This book is set a thousand years in the future after a plague has wiped out most of humanity (Captain Trips kills 99.4% of the population in The Stand). A group of explorers set off from Memphis to find a treasure trove of Roadmaker artifacts. Roadmakers being the people who existed in the world pre-plague. Only one of them returns and he is a bit crazy after the experience of it and kills himself. The main storyline deals with the daughter of one of dead questers completing her father's quest. Great book and definitely (for me) an unintentional sequel. The events of Eternity Road could have conceivably happened after The Stand. This brings me back to the original reason I posted this musing. I didn't really intend to write about The Road just yet but ... oh well. I stumbled on The Road quite some time ago so it isn't a book I just picked up. It has stayed with me for a long time though. I was really embarrassed when Oprah decided to make it one of her book of the month reads. Here I am reading Dark Advent one week then (unbeknownst to me) reading an Oprah Book the next (I got a bit of teasing from my wife for that one). If I had known before I started that legions of bon-bon eating house fraus would be reading it I would have probably passed. -- No I would have definatly read it anyway. I love a good grim well-written apocalyptic tale, and it is a rare PA that gets any grimmer (Level 7 by Mordecai Roshwald springs to mind). Plus it is the only PA book to ever win a Pulitzer. So the reason I wrote about The Road for two reasons. Firstly, I just wallowed around in both books by Susan Beth Pfeffer, Life As We Knew It and The Dead & The Gone. As a further example of the Unintentional Sequels I offer The Road. Secondly, this book will be released as a film November 26th 2008 (filmed in Oregon a mere stone's throw from the set of Twilight). In The Road there are descriptions of not being able to see the sun or the moon and needing to breathe through a mask. All these things are images from both of the Pfeffer books. As I read the book I tried to figure out what had happened to cause the world to end and I just couldn't figure it out. I have read many reviews that seemed to think nuclear attack. I had my doubts because there was no description of radiation or burns. None of the elements of nuclear attack are even mentioned. It does have an ash filled sky and cold and starvation. Also cannibalism. 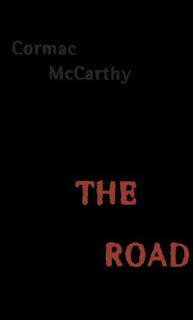 The Road features cannibalism but it wasn't a plot element of either Life As We Knew It or The Dead & The Gone. (I think that Susan Pfeffer was just a bit gun shy about people eating each other in a book geared towards teenagers. She did however have the characters ask about it as sort of a last resort.) Recent details mention that McCarthy wrote it as a meteor impact senerio. That fits Life As We Knew It as well. 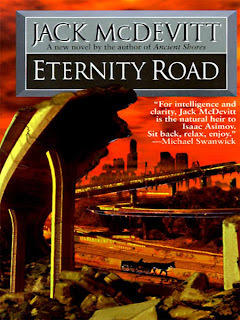 The point is that both Eternity Road and The Road are fantstic books that just happen to be good follow-up books to other great books. This little jem came out of the book The Martian Chronicles by Ray Bradbury. It's a very short read and is available to read for free on the interwebs. If you would like to read it, enjoy. Click here for the text: There Will Come Soft Rains then read the rest of the post. I read that story quite a while ago when I read The Martian Chronicles. It's stood out for me in stark detail for years. The house taking care of itself. The feeling of repetition. Day following day with not the slightest disturbance to change the ebb and flow of time. I also enjoyed the slow reveal of the story. Up to a certain point the family might just be on a vacation of sorts and just forgot to turn of the artificially intelligent house. Great read. I have even stumbled over it several times in many different PA anthologies. This story stands on its own apart from the other stories in The Martian Chronicles as well as in anthologies I've encountered it in. I decided to take time to write about it for this post because I recently found a blog titled There Will Come Soft Rains. I had been trying to find a workable (and interesting) URL for this blog and had been using different iconic examples from different books, poems and even song lyrics. The point here is that when I tried There Will Come Soft Rains I found it to be taken but not just taken -- oh no! -- it had been taken by a teacher who was using blogging as a way to have students respond to different literature. Her site was simply giving directions to her students. She used her comments as a place for students to turn in the work. A pretty slick idea. I just wish she hadn't parked on so many good blog titles for this. Oh well. Who is the main character in this story? Explain. The main character in a story is the protagonist. In a work of literature to determine the protagonist you ask yourself who changes over the course of the work. In this book there are about four 'characters' mentioned, a narrator, the house, a dog, a fire. The narrator is constant. Just a voice giving details. The dog enters the story and then exits quickly. The fire is a foil to the house. The fire is the agent of change. The main character is the house itself. At the beginning of the piece the house is cultured and refined. It is systematic. All things are ordered and strictly scheduled; regimented. It is after all a machine and that's the way a machine is expected to act. When the tree branch breaks the window and starts a fire the house changes. At first it marshals it defenses and fights the fire but as the fire gains in strength the house begins to act erratically and with fear. At the end it accepts its fate but tries to pack in life as it hurries to prepare food on a mammoth scale. What is the main conflict in story? Classify it according to our examples of external conflict. Be sure to give details and examples. I don't know what "our examples" are but I would say the conflict is 'Order vs. Chaos' if I had to choose conflict. And it is an external conflict. The house is definitely not struggling with itself here. Order is symbolised by human society and also by the exact timed out schedule of the house. Chaos is symbolized by the fire. Both types of fire; the more conventional fire lit by the stove when the branch breaks the window and the less ordinary fire lit by the nuclear bombs that fell on the city. With the example of the 'Order vs. Chaos' struggle between fire and the city, the city loses quickly. It cannot struggle to defend itself in any way. Later when the branch breaks the window and the fire starts, the house mounts an intense and furious but ultimately futile defense. The specifics of the defense gets into personification and I will respond to the question a bit later. What major event caused the house to be empty? Nuclear war. This is part of the slow reveal. The story begins in the house on what could be an ordinary day. The viewpoint expands slowly until the outside of the house and the city is revealed. The description of the burned silhouettes of the family doing ordinary things is the tell. Mom working in the flowerbed, dad mowing the lawn, son and daughter throwing the ball back and forth. It even pulls back further to show the radioactively glowing city. The house became vacant as a result of man's final war. Look for instances of personification in the story. Personification is making a nonhuman object human by giving it human characteristics. Examples of personification throughout the writing include the house being compared to a spinster as it went through its daily duties. So much attention given that the house is 'paranoid'. The best example of personification come when the house tries to save itself from the fire. It is described as an army doing battle with he flames. Later it speaks of the house with a 'skeleton' as having skin red vein and capillaries. The house isn't the only character in the short story though. The fire is also described as being clever as it wages its battle against the house. What kind of feelings were elicited while you read the story? I guess I felt sad. The house was left all on its own. It was a sentient being that was able to experience dread of death. The family should have left some sort of program in place for a time when it no longer needed to serve anyone inside it. The scene of the burned silhouettes has always stayed with me. A truly great work of fiction. What better way to start off my new blog then with a reaction to the most famous novel of the apocalypse ever? I am talking about Stephen Kings masterwork The Stand. I would say it has the number 1 spot in my love of apocalyptic reading. I especially loved it when he told me loud and clear not to buy it right up front in the new edition. I was ready for it not to have the characters in the book doing new and fantastic things; I would however have liked a bit of editing. This next part is for you Mr. King. Mr. King: I really enjoyed the book and loved the 'complete and uncut' version but I was wondering why you didn't fix the gigantic glaring mistake when you went back through it? I'm talking about Harold Louder's Permacover notebook here. Yes, the same one that he wrote out his pathetic apology/suicide note. Now, Mr. King you wrote that Harold writes in this notebook in chapter 64. He says how sorry he is and how he was misled. Signs his name 'Hawk'. Then, 'he puts the notebook into the Triumph's saddlebag. He capped the pen and clipped it into his pocket.' Then shoots himself in the mouth. Later when Larry Underwood, Glen Bateman, Ralph Brentner, and Stu Redman were making their trek to Las Vegas they stumble on, who else, Harold Louder. What do they find? Harold's buzzard ravaged corpse. And get this (from chapter 72) 'The buzzards had worked him over pretty well, but Harold still clutched the Permacover notebook in one stiffening hand'. So my question here is, how could Harold put the notebook in the saddlebag and shoot himself yet still have it in his hand when the boys found him? Why didn't you fix this in the 'uncut' version? Just wondering if you could clear this up for me.